Bullying can occur anyplace where young people connect—in schools, at camp, on sports teams, or online. No school or community is “safe” from the devastating effects of bullying—but you can learn how to take effective, positive steps towards preventing bullying and stopping it when it occurs. Creating schools and communities that are free of bullying requires EVERYONE – adults and youth– to understand that bullying is unacceptable, hurtful and preventable and to know what they can do to stop it. Here you will find practical tools, resources and real stories to help your school and community to understand, prevent and intervene to stop bullying. • Use the 3 Bold Steps: Preventing Bullying to learn how to Partner, Plan and Act to address bullying in your school or community. How do you know if you have a bullying problem in your family, in your school or in your community? A culture of silence often surrounds bullying. Many young people who are bullied never tell anyone. But just because you don’t see it, and youth don’t talk about it, doesn’t mean bullying isn’t happening. Even when young people don’t report bullying they often show warning signs. One way to ensure that bullying incidents aren’t being overlooked is to ask young people directly about their experiences. Many schools and communities have effectively used anonymous surveys to find out what is really going on. See in the video snapshot below how the public schools in Albemarle County, VA used a Peer Support Survey to identify students who were being bullied. What can you do to prevent and stop bullying? The good news is that bullying can be prevented by teaching social skills to young people and focusing on changing the climate of tolerance. Send a clear message. Across the nation, schools, youth organizations and even local businesses are working together to send a clear message that bullying is not okay and will not be tolerated. See in the video snapshot below how the city schools of Pueblo, CO engaged local businesses to create safe havens for youth who were being bullied. Teach social skills. Parents, teachers and community members are also teaching young people how to treat each other with kindness and respect. These schools and communities consistently show children that they are valued, respected and safe. They also teach youth what to do if they are bullied or see bullying. It is best to start teaching these skills in early childhood. Always intervene. When bullying does occur—it is critical to intervene. Here is a list of essential steps: (1) stop the bullying; (2) support the bullied youth; (3) support the young person who was bullying; (4) impose immediate consequences; (5) protect the bullied youth from future bullying; (6) engage and empower bystanders. 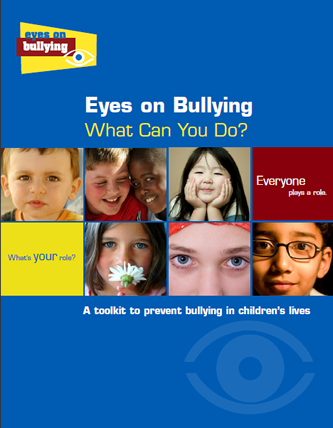 Download the Eyes on Bullying Toolkit for additional insights, strategies, skills-building activities, and resources. Across the country, communities are using unique strategies to prevent and stop bullying. Here, learn from their experiences through their Real Stories. Engage and empower bystanders. One of the most powerful and effective actions any school or community can do is teach young people and adults to be bystanders who take positive action to stop and prevent bullying. Schools and communities across the country have created programs to empower bystanders of bullying to safely intervene in the situation or report the behavior. These approaches have been extremely successful in reducing bullying behavior. Voices Against Violence is a unique tool for helping schools and communities address the critical role that bystanders—both youth and adults—can play in preventing bullying. Drawn from real-life situations that bystanders face, the stories in the videos are designed to start discussions in classrooms, teacher and school staff meetings, in-service trainings, parent meetings, and other opportunities that bring school communities together. Features insights, strategies, skills-building activities, and resources. Maria Fieth and Troy Davenport explain how the Safe Haven project united Pueblo, Colorado students and the business community in creating bullying free zones. Bullying is down 26% in Albermarle County, Virginia; June Jenkins shares a prevention strategy that encourages students to identify victims of bullying through an anonymous peer support survey.